How do I set up Deal Syndication? For every "funded" Merchant Cash Advance deal in MCA Suite, users can setup syndication. Syndication is when there are multiple investors participating in a merchant cash advance deal. Prior to setting up syndication, you must have Contacts Types in MCA Suite that are "Investors." If your company is one of the syndication participants, you must be in MCA Suite as an Investor contact type. To syndicate a deal, go to the Deal Tracking page of the funded deal and click on syndicate. On the Syndication Setup screen, you will need to define the investors of the deal. To define investors, type in the company name of the investor. This field performs a look-up against Companies with a Investor Contact Type. You will also need to define the participation percentage that is used for collection. Next to the percentage, you can define a management fee for each participant. The management fee (house fee) will be applied against the collection amount. The total participation percentage of the deal must equal to 100% in order for MCA Suite to recognize the deal as a syndicated deal. 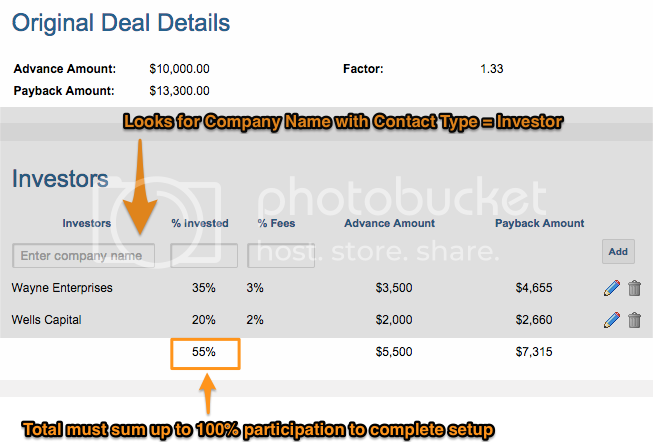 If there are investors you regularly syndicate with and/or their participation percentage is the same for every deal, you can set up default investors and participation percentages. When the Merchant makes repayments to the deal (transactions applied to the deal), the same investment percentage is used to divide between syndication participants. The funded merchant cash advance deal was $10,000 for 1.33 with a payback amount of $13,300. Wayne Enterprises invested 35% ($3,500) and agreed to pay a 3% management fee. Wells Capital invested 20% ($2,000) and agreed to pay a 2% management fee. 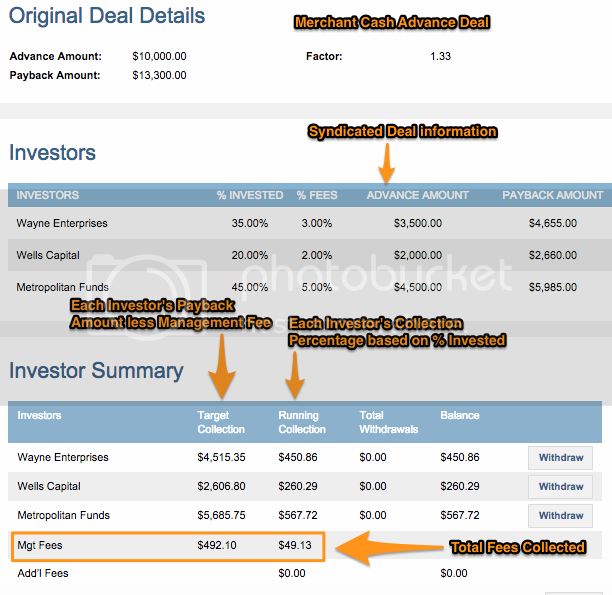 Metropolitan Funds invested 45% ($4,500) and agreed to pay a 5% management fee. The Investor Summary shows each investor's Target Collection (what s/he is supposed to received for the investment), Running Collection (the percentage received from the Deal), Total Withdrawals (the amount the investor has taken out) and Balance (Running collection minus Withdrawals). To record withdrawals, simply click on the "Withdraw" button which will bring up a screen for you enter the description and amount. You can go to the Contact Company's Deal page to view a complete list of syndicated deals the company has participated in. Below is an example of Metropolitan Funds, where you can see its investments and running balance. You can also setup an "Investor" user on your MCA Suite instance to allow your investor to log into your CRM and view their deal details directly. Click here to view the article on how to create an investor user account on MCA Suite.